Lets discuss some safety tips while traveling/backpacking in a cold weather environment. Backpacking in winter can be very rewarding as long as we travel properly prepared. 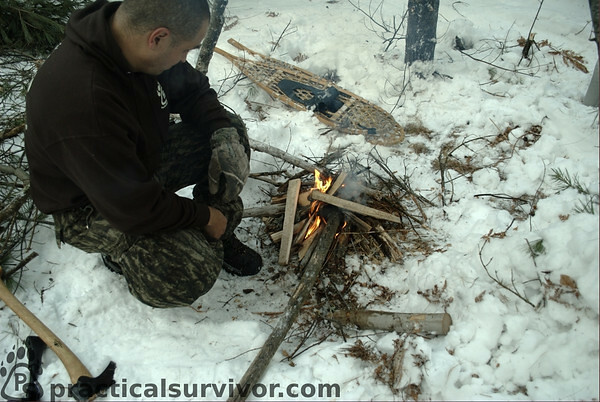 It seems that the word survival has a certain stigma carried with it within the backpacking and hiking circles. For this reason we like to establish the article by using words such as emergency preparedness etc. Whatever you prefer to call it, the fact is that people too often hike out into the woods unprepared. These neophyte wilderness travelers are either hung up on the latest backpacking gear, or too proud to look at the situation honestly. We find these people either succumb to the environment when the slightest change is faced to their perfect equation or a lot of tax dollars are spent sending rescue teams to save them. Lets not forget that often times, they are putting the life of the rescue search team at stake. --From 1992 to 2007 there were 78,488 people involved in 65,439 SAR incidents. These included 2,659 fatalities, 24,288 injured or sick people, and 13,212 "saves," or saved lives. --On average there were 11.2 SAR incidents per day at an average cost of $895 per operation. Total cost from 1992 to 2007: $58,572,164." Simply put, a lot of times people are traveling into the wilderness unprepared. Inevitably each year hikers and backpackers go into the wilderness unprepared. This usually comes from a best scenario mentality. The weather station said it is going to be in the sixties today. I do not need that extra layer. On one backpacking forum a member was seeking advice on knife selection. One of the "experienced" members of the group asked the question, "Why do you need a knife? I have been backpacking for years and NEVER needed a knife." We could say this is comical. If we lived in a perfect world where there was no chance of getting lost, falling down, or getting hurt this may make sense. We know with proper preparation and planning we can avoid a lot of situations yes, but perhaps a little room for unforeseen events shows wisdom. Whether you want to call it emergency preparedness or survival, the point is to get out alive. If we are wrong, then why is it every year people get lost and die in the wild. There have been instances of skiers getting lost and spending several days lost while search parties have been unable to locate them. Why do you need a knife? Why do we need an emergency kit? Why do we need a contingency plan? It is simple, we want to come home alive. Survive or perish, you choose. Does anyone question why we need a first aid kit or fire extinguisher in our home? Ignore the ignorant and follow your gut instict to prepare. There is no way we can cover every contingency in a short article. We are not claiming to know everything there is to know about winter survival. What we are trying to do is share a few tips that we learned along the way. Read multiple sources and always test what you read. Be weary of people and pages advocating you go into the woods without gear. If your goal is to test your skills, you can have a bag near by in case of an emergency. Every Bushcraft and Survival manual will discuss fire starting. There is a big difference between reading about fire starting and having the skills needed to start a fire. 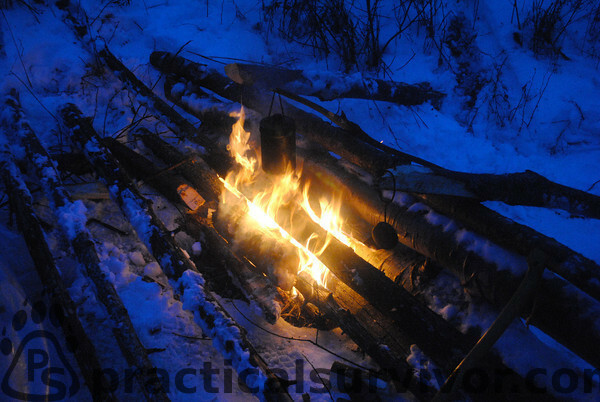 It is especially important to practice building a fire in adverse weather. 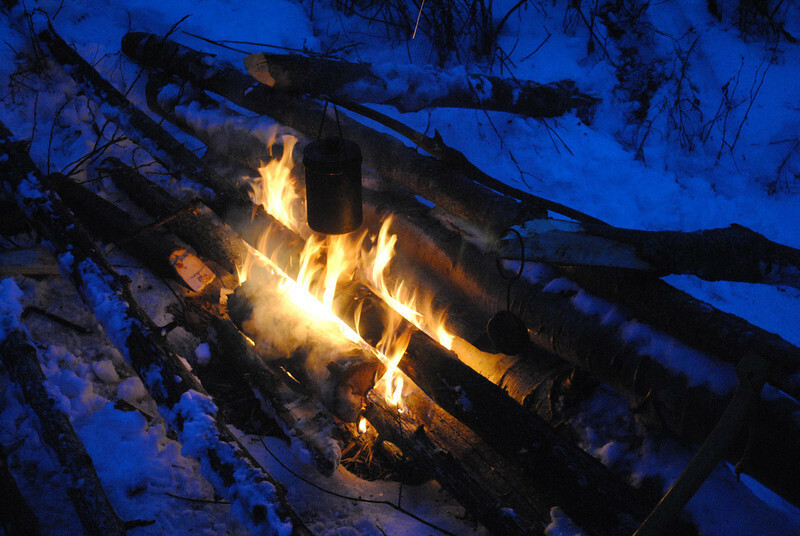 Spend a night out in the cold wilderness and you will quickly learn to appreciate the benefits of a fire. Fire gives us the option to cook a meal, purify water, clean our utensils, add warmth to our shelter, and dry our clothes. Fire also gives us a psychological edge, there is just something uplifting about the dancing flames. Fire helps improve our morality and give us a sense of control. But to a survivalist fire can mean the difference between life and death. Often we find that people will purchase a fire starting tool and not properly test it. We do not mean start a fire in optimal conditions using drier lint, we mean TEST your fire starting kit. Do you feel confident that your kit will help you start a fire under the worst conditions ? If you have not started a fire in the snow or right after a rain storm, then you cannot answer this question honestly. Along the same line is the idea that we will use primitive fire starting methods and do not need a lighter or other fire starting tool. People on forums discussing carrying their bow drill kit in a zip loc bag to start a fire. If you are going for a walk in your local city park this may be acceptable but in a true wilderness emergency you should have anything that gives you the ability to start a fire under adverse conditions. Learning primitive fire starting methods are a great skill to carry in your tool box. It will improve your expertise in choosing tinder and wood but to put your life on the line is naive. Carry several fire starters and types of tinder. During a recent hike near the Appalachian Trail, the temperature dropped into the single digits with the wind-chill taking it below zero. We were trying to make sure we did not sweat as we carried our packs up the side of a mountain. Once we decided to stop for the day, we began our nightly routine. Shelter and fire were on the top of our list of things to get done. 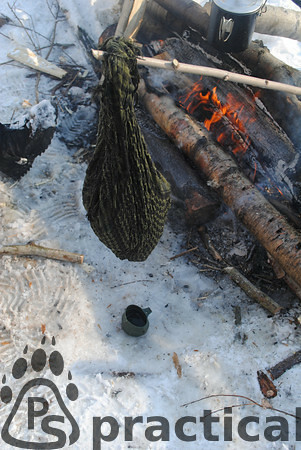 We removed the snow from the ground, built a solid wooden base to start the fire and started to build a tepee fire. Small twigs and feather sticks were used at the base and we gradually increased the side of the fuel. For some reason the humidity in the air was high. The precipitation was a mixture of snow and sleet. Later on we would figure out there was a cloud sitting right on top of us. One of the members of our group pulled out dryer lint and placed it in the middle of the tinder/kindling bundle. The dryer lint was not protected by petroleum jelly so immediately it became waterlogged. The first attempts to start a fire were done with two disposable butane lighters. Both lighters failed to ignite. Next attempt was with the well known Swedish Fire Steel Ferrocerium rod. The sparks landed perfectly on the dryer lint but failed to ignite. Finally we used a Trioxane bar to start the fire. Do your research, carry several fire starters and tinder choices. Develop a habit of carrying a fire starter with you on all trips even if it is a day hike. Personally I carry a kit in my day pack and tether a fire starter to my belt loop. The Light my Fire Swedish Firesteel is an excellent choice. Some people prefer to carry a Magnesium Block. The magnesium block easily scrapes into a pile of easily ignitable and highly flammable tinder. Doan Machinery makes a high quality magnesium block. We recommend their block. In our Magnesium Firestarter article we discuss different methods for a successful fire using the block. In Bushcraft we learn to start a fire with the bow drill, fire piston or flint and steel. All great skills to have, but if we were to fall into a cold creek and the temperature is below freezing, we do not have time to play with using primitive fire starting methods. There is a large selection of fire starters available to the outdoor enthusiast. Modern fire starters such as magnesium blocks and Ferrocerium rods are inexpensive and lightweight. A reliable fire starter is essential to anyone involved in outdoor sports. With time and experience, we should be able to find/make tinder in most outdoor situations. However, since we are on the subject of safe winter travel, lets change the way we think about tinder for a minute. What do we need? We need tinder readily available that will ignite in the worse conditions. Tinder can be made using cardboard and wax or you can choose the more common cotton ball covered in petroleum jelly. We carry a tin full of petroleum jelly cotton balls and Trioxane bars as a backup. Parachute cord is attached to the tin to make it easier to open with cold hands or if wearing gloves. Remember to shield your fire from the cold ground and from the wind. Use sticks to build a base to keep your tinder and kindling off the ground. A fire deflector can help keep the air currents away from the fire and reflect the heat onto your shelter. Imagine taking a beautiful day hike during winter. The spectacular views and solitude gives us a chance to see wildlife from a different perspective. So if we are going on a day hike, why should we bother thinking about shelter. Perhaps a person can become lost or disoriented. Hopefully we are not adding an injury to the scenario. A small pack could make the difference while we wait for rescue. Can be used as a shelter or protect you from rain while on the move. We can magnify the benefits of a fire by using radiation to bounce heat within a shelter much like Mors Kochanski's super shelter. Parachute cord - Numerous uses from shelter building, to fishing and traps. Can be used as a makeshift raincoat. Can be filled with leaves for a shelter door, pillow, or as an insulation layer. Military ponchos, backpacking Tarpaulines have snaps and grommets that help configure it in different configurations. Test your tent near your home if you have never used it in winter time. Most tents are built so they have a lot of air circulation. It is also a good idea to learn some basic emergency shelters. Lean-to - A lean to shelter can be built quickly using a tarp, or poncho. Debris Shelters - Shelters built using leaves, or pine boughs can be warm and dry if properly built. Snow Caves Snow caves and Quinzhee huts can take you out of the wind and protect you from precipitation. Keeping hydrated is just as important in cold weather survival as it is in the desert. How can that be? The human body looses water continually through normal body functions. Whether we are urinating, sweating or just breathing the body uses this precious fluid. If you have ever spent any significant time out in a cold environment, you probably noticed a greater urgency to urinate. There are multiple reasons why this phenomenon occurs. Perhaps we are drinking high levels of caffeine while drinking coffee, tea and chocolate. Its been said that the body reacts to the cold by shrinking the blood vessels around our extremities. This causes the body to centralize our body heat in order to maintain our core temperature. This can reduce the overall volume of the circulatory system which increases blood pressure. The body's response to this is to reduce the fluid volume by getting rid of water in the urine. Regardless of the reason, we are loosing fluids at a pretty fast rate. Add to the cold,higher levels of stress and the rate at which we loose fluids will increase. As the body becomes dehydrated, our blood thickens. This causes the body to work harder and increases our chances of frostbite. As we get cold, the body will react by trying to keep our body core warm. The body is trying to protect vital organs and will sometimes sacrifice extremities to protect a persons life. Simply put, proper hydration is very important in decreasing cold exposure problems. So try to keep track of how much water you drink. Do not wait until you are thirsty to drink. Make a conscious effort to remind yourself I need to drink water. Lets not forget that drinking some warm liquid will help lift your spirits. * Unless you are being very active, or its the earlier part of the day, try to avoid eating snow. We have eaten snow numerous times while moving on snow shoes. Grabbing the snow from branches rather than the ground can avoid contaminated water issues. However note that eating snow in the later part of the day could add to the lowering of core body temperature. * Carry a Billy Can tied to a string. Avoid getting close to bodies of water where the ice could crack or you could slip and fall. Falling into a river or stream in the middle of a winter backpacking trip, could spell disaster. 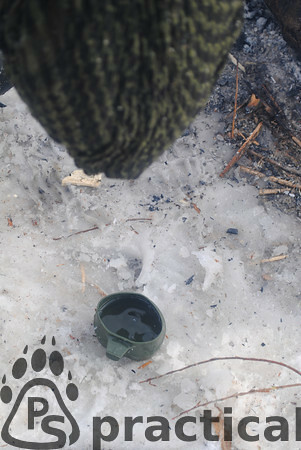 * We have filled our canteen or water bottle with snow and carried it between our clothing layers while hiking. This will often melt the snow. * If a container is not available to melt the snow, there are multiple ways to melt snow next to a fire. A mosquito net can be filled with snow and hung close to the fire. A snow marshmallow is another option to help melt snow. 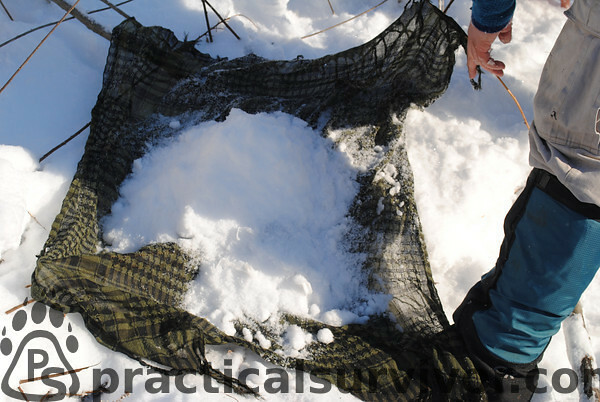 Simply pack snow in a ball on a stick and place it near the fire. Catch the drops of water with any material available. There is a long list of tasks we can accomplish using a Shemagh. Add melting snow to the list. Covering what items to carry in an emergency kit is not as important as knowing why you carry them and HOW to use them. The equipment we carry will vary according to the environment we will travel. It seems common knowledge that if a person is to travel say a jungle/rainforest environment, the items found within our pack would be different than in the desert. How the items are used would also be different. In the swamp we can use a mosquito head net to keep the insects away from our face or as a fishing net. The same mosquito head net can be used to melt snow in the North. Get familiar with your equipment and learn to use each item properly. Learning to use the equipment at the time of emergency will increase the sense of fear and helplessness. Lets not forget that some equipment does not work as advertised. One example of how our tools would vary is a wood cutting tool. Wood in the Northern Hemisphere is usually harder (heavier density) than in a temperate region. The wood in the north grows slower and the growth rings are tighter (more rings per inch). If there is a need to cut wood, the proper tool could make a huge difference. In a jungle environment a machete could be required to move through the dense jungle. We find that in temperate regions, we are able to do most jobs with a large knife (5 to 7 inch blade). Further North, an axe or saw is a valuable tool. Snow covers the ground level fallen branches so firewood will usually need to come from felling dead trees. Regardless of what your backpacking buddies say, CARRY A KNIFE! At least carry a multi-tool. Some of the emergency shelters we discussed can be built without a knife. However in a cold environment having a way to cut down wood and more importantly baton through the wood, is important. If the wood is frozen and/or wet on the outside, we can baton through the wood and make feathersticks to help start the fire. If lost and someone is looking for you a signal fire can be built. Bring a compass, be familiar with the area. If possible carry a topographical map of the area. GPS is a great piece of equipment to have but it should not be your only tool for navigation. 15- Add whatever cordage you prefer - parachute cord, natural twine etc. Note: Snare wire can be added but food is not on the top of my priority list for the first 72 hours. This kit can be attached to your belt or pack. Both of the kits above are fairly lightweight. During a backpacking trip we would carry a full pack. The full pack would include items such as a sleeping bag, sleeping pad, collapsible saw or axe. Layers, layers layers. This subject has been covered and beaten into the ground. Learn about the layer system. 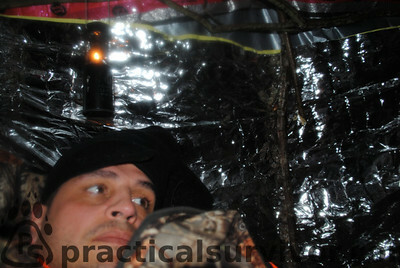 A jacket that is designed to keep you warm sitting in your hunting stand will become very hot while you are active. Avoid getting your clothes wet from sweat at all costs. This is just one way to configure the layered system. Improvements on clothing materials are helping outdoor enthusiasts every year. Recently we were caught in a rainstorm while wearing soft-shells. After walking for hours in the rain, we were completely dry. Footwear - should have room to wear thicker wool socks. Wearing a sock-liner helps keep feet dry. Gloves - A layered approach on gloves is good practice. It is a good idea to attach the gloves to your person. A lost glove could mean frostbitten fingers or worse. Gloves can be attached by cordage through one sleeve to the other. This should make sure a glove cannot be lost. Remember if you allow your hands to get too cold you can loose dexterity. After a certain point, you would be unable to start a fire of build a shelter. Again, test your clothing before going out to the bush. Eye wear - protective eye wear can help keep the glare of the sun our eyes and protect the eyes from flying debris. Head wear - Keep your head covered to help retain heat and protect your ears.